Lighting can be an integral part of any service station. The right lighting can be the difference of whether a customer stops at your station or not.New LED lighting can make your station or stations look that much better from the street. These new energy efficient LEDS save you time and money. At Island Pump and tank we stock a wide variety of LEDs to choose from. 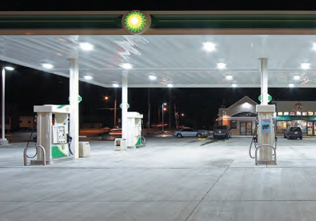 Whether it's LED's for your Convenience store or lights for the canopy, Island Pump & Tank has the right LED's for you. Every station or facility needs lighting for security and piece of mind. At Island Pump & Tank we use many different bucket trucks to service those hard to reach areas. Our technicians have various safety training to ensure the job gets completed in a the safest way possible. We are a distributor for CREE and LSI industries lighting. We offer the all ranges in LED depending on your budget. Can't reach those canopy lights? Contact us so we can help you!